This is one of my favorite after-Christmas storybooks! It is almost 10 years old now, but just as relevant as it was when it was first published. I used to read it every year in my classroom when we returned from our winter break. A little background for you…Before the kids left in December, I sent home a note saying they were allowed to bring one item to school in January that they could share with the class. And I talked about it with them ahead of time. They understood that meant only one item, that said item must be something they received over the holidays, that we were going to talk about our items during the morning meeting (which meant morning meeting was going to go on, and on, and on that day… oh well, if you can’t beat them join them), and that it should not be the most expensive item they had received because we were going to share these items in the group. This was actually a pretty popular homework assignment, and we hardly ever had anyone who forgot to bring something. On occasion, some poor child did forget, but they still got a chance to talk to the group about their favorite gift. So, now we’re all up to speed… On the first day back, the kids were exploding with excitement and I was prepared! We sat in a circle, read the morning message from me welcoming them back for the new year and describing a special item I had received that year. I would share my item, usually a book or scarf or new ornament for the tree. Then I would tell them who gave it to me and why I liked it so much. Then it was their turn. Every child told us about a special gift they had brought to class. We would pass it around the circle and the child would talk about who gave it to them and why it was special. There were lots of gifts from Santa, mom & dad, grandparents, etc. Seriously, this took ALL morning! 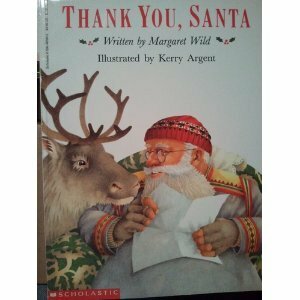 After lunch, I read Thank You, Santa by Margaret Wild and illustrated by Kerry Argent. This book was published in 1994 and is simply one of the best books I have read to introduce students to letter writing. The illustrations are gorgeous and the kids are mesmerized by the story. In this story Santa and a little girl, Samantha, exchange letters every month for a year, so there are a total of 12 letters written in two hands spanning two pages each. Starting in January, Samantha writes a thank you letter to Santa for the gifts she received. He is so thrilled to actually get a letter in January, that he writes her a letter in February. They continue back and forth writing letters each month for the whole year. Another wonderful element of the story is that Samantha lives in Australia so her seasons are the opposite of those in the northern hemisphere, giving us another layer to enjoy in this story. Santa teaches her about the animals living near the north pole and she is worried about Santa’s littlest reindeer at the North Pole and the polar bear living in the zoo in Australia. Many of the letters are part of gift packages that Santa and Samantha send to each other throughout the year as well. Her last letter to Santa is her wish for snow for the polar bear at her zoo (in her December summer). The final illustration shows us how Santa grants her Christmas wish. Of course in the classroom, we talk a bit about the 12 months of the year. But the biggest lesson I prepared is letter writing. We spend another good portion of the day introducing letter writing – the reasons to write a letter and the five parts of a friendly letter. Before the students go home for the day, they draw a picture of the gift they shared with the class and make a very quick word web surrounding the picture including the name of the person who gave them the gift and some important information about the gift. All of the gifts go home at the end of the day with another note from me asking parents to send me the complete name and mailing address of the gift giver. We spend the rest of the week writing our thank you notes and envelopes. At the end of the week, I send these home to parents with instructions to read their child’s letters and to please add the stamp to the envelope. Some children have informed me that their parents also sent a photo of them playing with the gifts to the gift givers. I hope you get a chance to read and enjoy this fabulous book! On a note of full disclosure…. in my last few years of teaching, I had a scripted reading program which left me no time during reading class to be creative. However, and I’m sure some of you have already figured this out, I started using only our writing time and used this book to introduce the concept. The point is, if it is something you love, you make time to do it! I used great books to introduce writing, science, social studies, and even math concepts. You can too! If you like this post, don’t forget to comment and please share it with your friends!